Travelled to Alaska for 23 days in August, 2018. Prior knee problems prevented me from doing an 8 day backpack with 3 others. 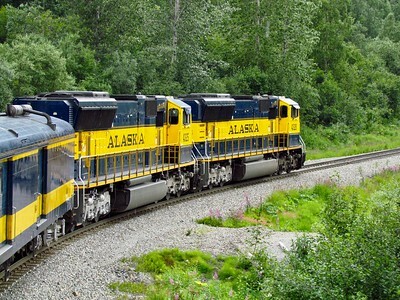 So I rode a luxury domed car on the train from Anchorage 233 mikes north to Denali while they did hardest backpack of their lives. I spent 2 full days in the National Park seeing elk, grizzlies, moose, Dall sheep, and a beautiful red fox. 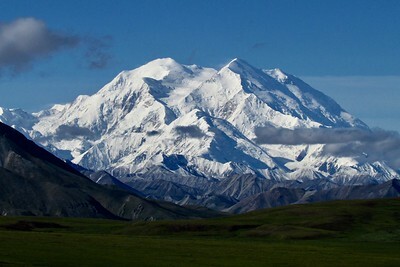 I'm so glad I booked 2 full days because Denali, the mountain, was not visible at all on the first day, and looked SPECTACULAR on the second one. 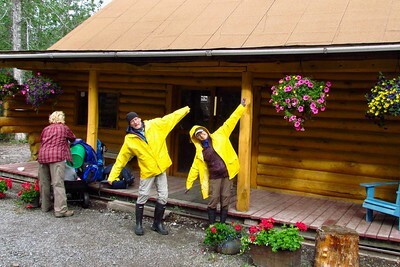 Back in Anchorage I shuttled east with Carl & Judi some 300 miles to the small town of McCarthy, stopping along the way to pick up our rental raft. 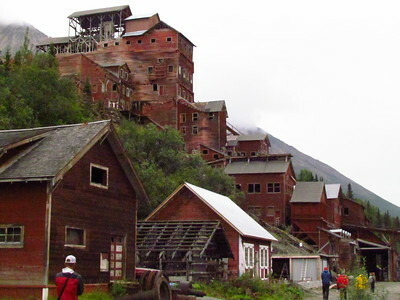 Next day we toured historic Kennecott Copper Mine company town. On Aug 15, 2 short hops aboard a bush plane (built in 1948!) got us to Jake's Bar (as in gravel, not drinking). 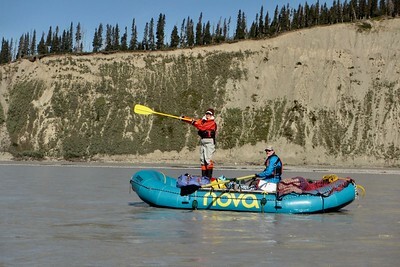 Chitina is a nice river, but water was 39 deg and moving fast, so also a serious river. We had really good weather for our 3 1/2 days on it, found good camps, and enjoyed it very much. 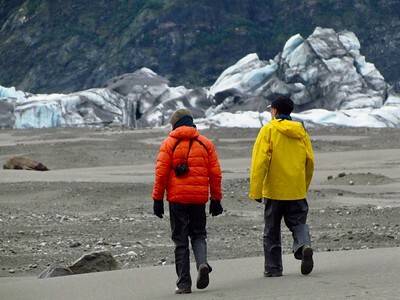 Copper River country was even more beautiful, with considerably taller mountains, big waterfalls, high hanging glaciers, and extremely dense surrounding forest. Before our flight from McCarthy we knew that on Aug 9 Copper River had been at its 4th highest flow in recorded history, and we would not have run it at that level. But by Aug 16 when we launched we also knew it was only about 20% above normal. So we had an idea it was well below normal by Aug 20, but no way of knowing how quickly it went back up due to 24 hrs of steady rain on Aug 21. That was a good rest day, since fast current had put us ahead of schedule. Quote of the day on Aug 22 was from Brian: "Today was a BEAUTIFUL day on the river. And yesterday would have been just ugly." Found a great camp that afternoon and spread everything out to dry quickly in the sun. I decided to run Abercrombie Rapids in the raft when I saw how high water was on 23rd, well up into the trees. Turned out the extra water washed out the rapids some, and Carl picked perfect line in the raft. Rich & Brian went farther left and ended up in the wave train, but paddled thru it successfully. That night was best camp of the trip, on huge gravel bar island. Even better, next day was a rest day. So we circumnavigated it twice, first by land and then by sea. This camp was 3 - 4 miles from Childs Glacier, and maybe 1 - 2 miles from Miles Glacier, and both were calving. Childs was especially loud, sounding like thunderclaps, and not distant thunder at that. 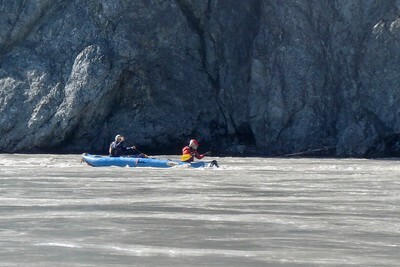 Miles Lake was quite full of ice from Miles Glacier, so we had fun weaving among the floes as we paddled back to camp. 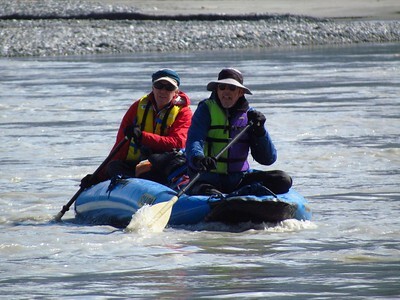 Next day we paddled down to near Million Dollar Bridge and walked over to the viewing platforms to watch frequent, dramatic calving of Childs Glacier, sometimes sending waves across river that we were to paddle the next day! Fortunately no calving when we paddled past the next morning, and we made a fast 14 miles, dodging icebergs in the river, to our takeout at the right side of 36 mile bridge where vans could pick us up from Cordova. So it was a GRAND ADVENTURE, in a beautiful place. And I'd like to go back to Alaska to see more of it. PS: Thanks to others on our trip for some borrowed photos. 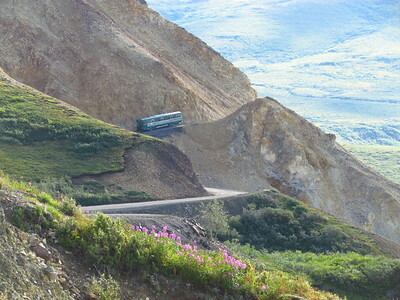 Denali is our 3rd largest Nat'l Park. To really see it you ride buses long distances into the park, & drivers are very informative. Road is mostly above tree line, so viewing is really good. 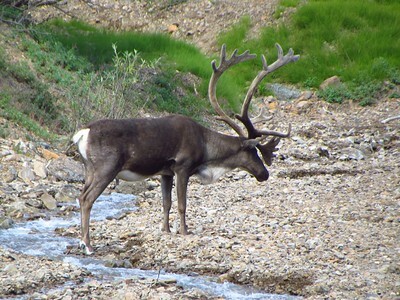 Buses stop for wildlife, windows go down, & cameras stick out. Saw 6 - 8 elk. 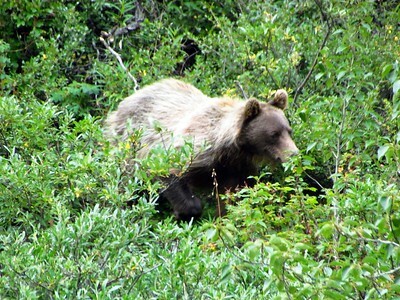 Saw well over a dozen grizzlies, including quite a few cubs. It's really helpful to bring good binoculars & camera with long zoom lens. Saw a few moose, and this one was HUGE, and only a few feet off the road. Our naturalist had never seen a bigger one in 35 years in the park. 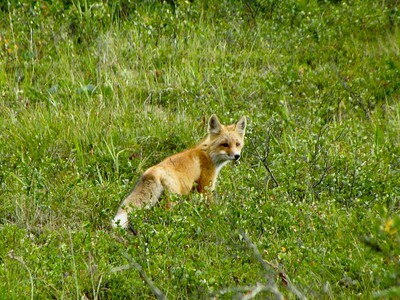 Beautiful red fox was my favorite sighting. We watched it hunt for about 15 minutes. It would creep up on prey, then leap up and pounce! 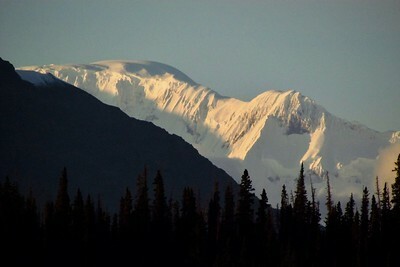 Denali is highest mountain in North America, & one of tallest in world because its base is low. Only about 30% of visitors get to actually see it. From Anchorage we were shuttled 300 miles east to McCarthy. 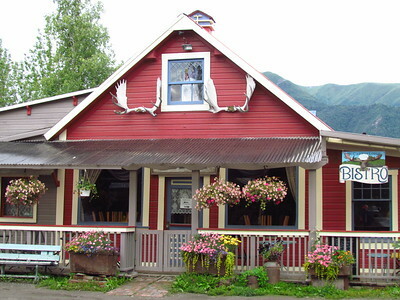 It was B&B (bar & brothel) town for Kennecott copper mine workers. 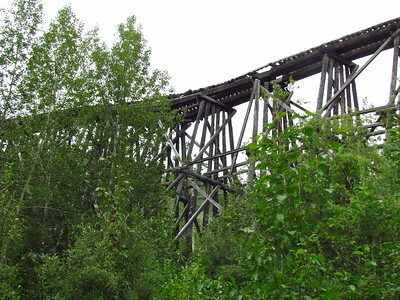 Along the way we'd seen remains of this railroad, built in 1910 to the Kennecott Copper Mine near McCarthy. 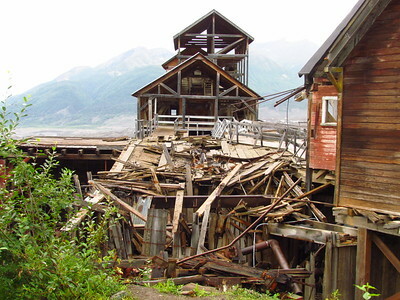 Toured remains of the Kennecott ore processing facility, a National Historic Site. It separated copper ore from all the limestone. Effort is being made to keep this historical site in a state of "arrested" decay. Though some areas seem less arrested than others. Next morning 6 of us, + boats, food, gear, etc. were flown to the Chitina River in 2 short bush plane flights by Wrangell Mountain Air. 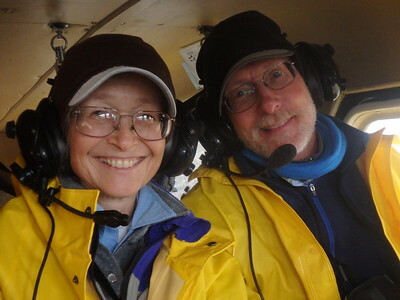 Judi & Carl can even look cute when crammed into the back seat of a bush plane that was built well before they were born. 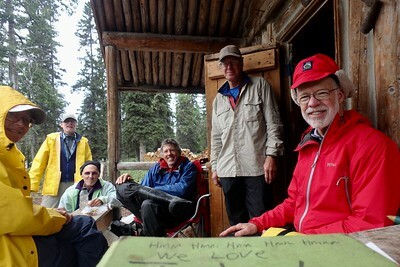 We were able to actually finish the river with all the people who started, seen here on porch of his one-room cabin at Jake's Bar. 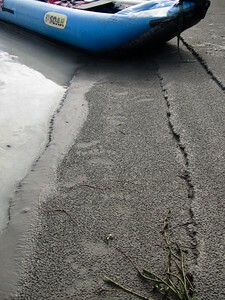 Having the raft allowed us to lightly load the canoes for greater stability to minimize chance of capsizing. Remember the water is 39 deg.! 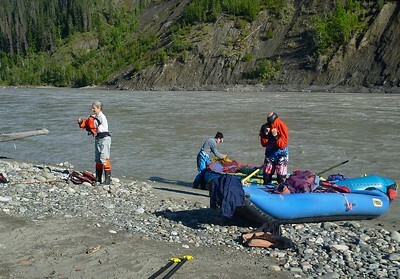 Enjoyed the great weather on the Chitina, though we had to carry stuff a ways to get above the soggy lower ground near river. Raft had far better views downstream than we did from canoes, so signaled us which side to go. Judi also did a great job rowing the raft. 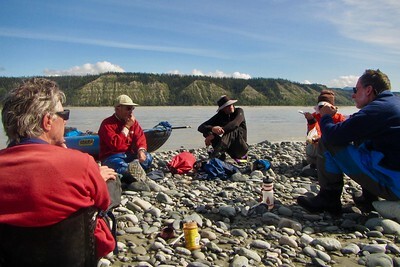 Nice lunch stop on the Chitina. It was a really fun group. Also shows here that the Chitina is a big river in it's own right. Rich & me paddling hard to avoid a small hole in the water created by that rock. This was right before our camp. Fresh moose tracks on our beach. 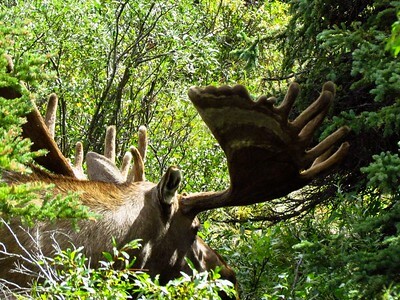 Moose are considered more dangerous than grizzlies. Very territorial, & will try to stomp you to death. 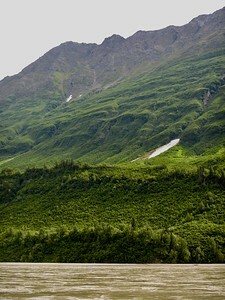 Copper River valley was much deeper & more heavily forested, with snow patches, big water-falls, & a beautiful verdant green in the sun. 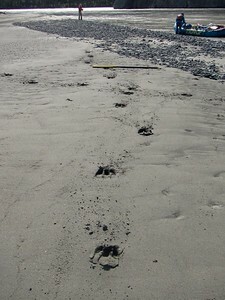 Small bear tracks on the beach where we landed to camp. But only one person actually saw a bear on the entire river trip. 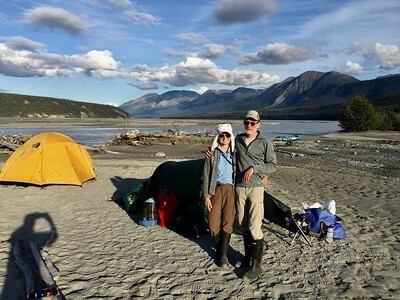 Favorite camp of trip was on a large gravel bar island between Miles and Childs Glaciers. And we had a rest day to explore around it. My night to cook. We had soup, then pesto pasta with veggies & salmon, & cookies for dessert. All 6 could squeeze into cook tent. Our morning walk around our gravel bar island gave us amazing views of all the "bergy bits" filling the channel from the Miles Glacier. 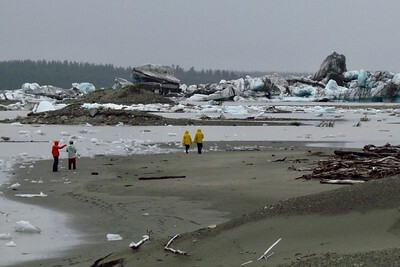 Brian, Carl, and more big icebergs that calved off from Miles Glacier.